The Directors of Arrow Energy says that the 450MW Braemar 2 Power Station has achieved operational status with all three 150MW gas fired generation units now fully commissioned and in commercial operation. 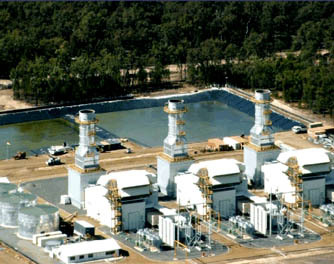 The Braemar 2 Power Station is owned by the NewGen Braemar 2 Partnership, a 50:50 partnership between subsidiaries of Arrow and ERM Power Pty Ltd (ERM). Arrow is currently supplying gas to the Braemar 2 Power Station at a rate of approximately 5.5 PJ/a, this will ramp up over the next 12 months to 15 PJ/a. The Tipton West JV (82% Arrow, 18% Shell) will contribute 3.5 PJ/a and the Daandine JV (70% Arrow, 30% Shell) will supply 11.5 PJ/a under a 12 year gas sales agreement. ERM will operate the power station and manage the electricity despatch. Revenues for the power station are underpinned by an electricity hedge agreement with Origin Energy Ltd for 300MW of electricity hedges for a minimum of 10 years, with options over an additional 150MW of capacity. The construction of the power station and associated high pressure gas pipeline has been completed at a cost of ca. $530m representing a saving of approximately $15m from original budget estimates. Commissioning and hand over of the final generation unit has been now been completed and Braemer 2 is in full commercial operation. The Braemer 2 Power Station will operate initially as a peak and shoulder period generator that will aim to despatch electricity during periods of higher electricity demand and capture the associated higher electricity prices during that time. As an accredited generator under the Queensland Gas Scheme, Braemer 2 also benefits from earning Gas Electricity Certificates. Arrow has been developing the Stratheden field within the Daandine area to supply gas to Braemer 2. The recent commissioning of the Daandine/Stratheden compression and gas processing facility was a major milestone in this development. Please be civil. Job and promotion will not be added into the comment page. Copyright 1973-2012. Scandinavian Oil-Gas Online. ISSN 1500-709X.